Does your veggie garden have a party pooper? Nothing spoils a good party like a party pooper! In the fruit and vegetable garden, we’re talking about actual poop… gross, but true! Animals – ranging from birds, rabbits, dogs, or even bears(!) – can leave their droppings in the garden. Animal feces may contain bacteria, viruses, and parasites that are harmful to humans. When people eat raw produce that has been contaminated with feces, it can make us very sick. Thoroughly cooking produce generally kills pathogens and minimizes the risk of foodborne illness. Symptoms of foodborne illness generally involve diarrhea, abdominal cramps, and nausea and/or vomiting, and can also include fever, fatigue, muscle aches, and more. Children, older people, pregnant women, and those with weakened immune symptoms can be at even greater risk of severe illness or even death from foodborne pathogens. Therefore, we want to be sure that we watch out for poop in the garden, and don’t harvest anything that may be contaminated! Can I just wash off the poop? Unfortunately, once produce is contaminated with feces, the contamination can be nearly impossible to remove. Crops such as strawberries or cantaloupes have a rough surface texture where pathogens can hide. 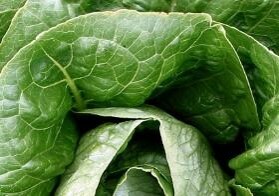 Leafy greens have a large surface area as well as folds that may be difficult to thoroughly wash. Many bacteria secrete "sticky" substances that help them cling to the surface of produce, making it even more difficult to wash them off. Therefore, gardeners should be careful to NOT harvest anything with poop on it! Leafy greens have lots of surface area and folds where pathogens can hide. 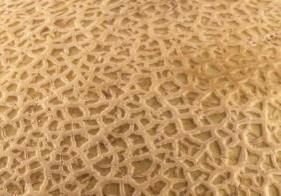 The rough surface of cantaloupe can harbor pathogens. 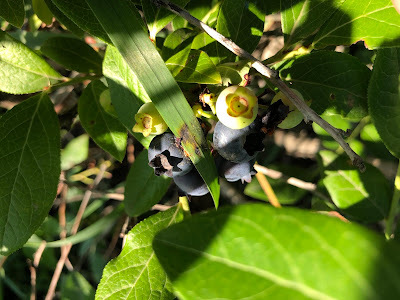 Sometimes feces can be difficult to see, such as in the picture of blueberries at the top of the page. If you accidentally touch something with poop on it, stop what you’re doing and go wash your hands with soap and water before returning to harvest. If you accidentally put something with poop into the harvest bucket, be aware that you may have spread contamination to the rest of your harvest bucket. Any produce that may be contaminated should NOT be consumed raw. What if there’s poop on the ground nearby? 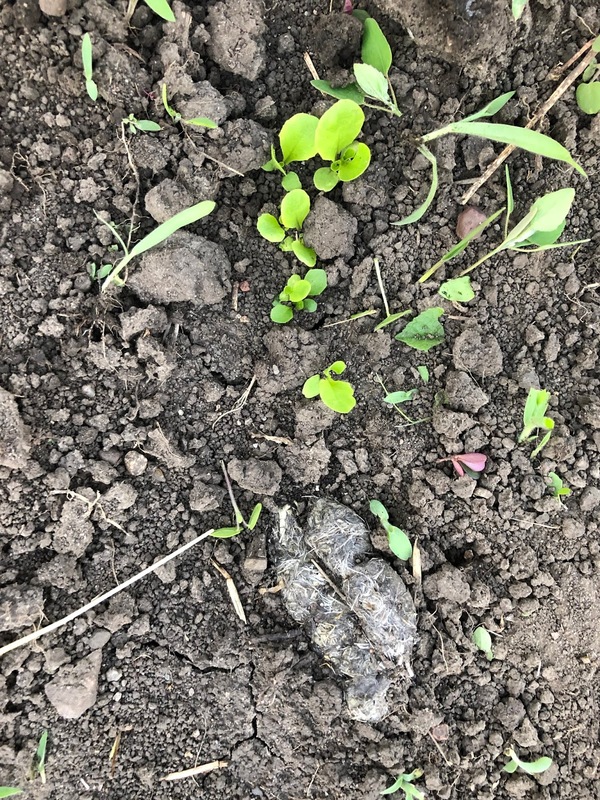 If you find poop on the ground or on the plants, don’t harvest anything that’s too close to the poop. 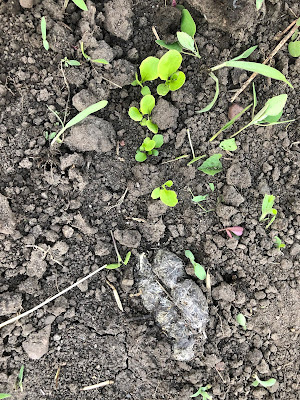 Crops that grow low to the ground are at greater risk of contamination from poop on the soil: leafy greens, cantaloupe, strawberries, and green beans are examples of things that grow close to the ground. Tomatoes, for example, are often staked above the ground, so they may be at lower risk of rainsplash. However, it’s wise to avoid harvesting anything that’s too close to visible feces – better safe than sorry! After you’ve finished harvesting, you can go back and remove the poop. Be sure that any tools you use to remove poop are NOT used for garden-related activities later on!